For the first time, to the best of our knowledge, a compact, eye-safe, and versatile direct detection Doppler lidar is developed using an upconversion single-photon detection method at 1.5 μm. 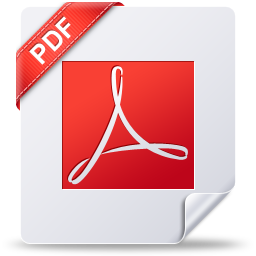 An all-fiber and polarization maintaining architecture is realized to guarantee the high optical coupling efficiency and the robust stability. 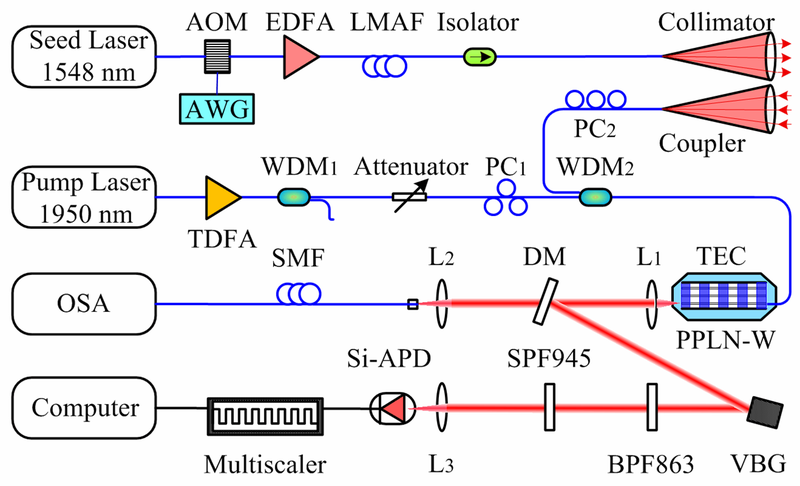 Using integrated-optic components, the conservation of etendue of the optical receiver is achieved by manufacturing a fiber-coupled periodically poled lithium niobate waveguide and an all-fiber Fabry–Perot interferometer (FPI). The double-edge technique is implemented by using a convert single-channel FPI and a single upconversion detector, incorporating a time-division multiplexing method. The backscatter photons at 1548.1 nm are converted into 863 nm via mixing with a pump laser at 1950 nm. The relative error of the system is less than 0.1% over nine weeks. 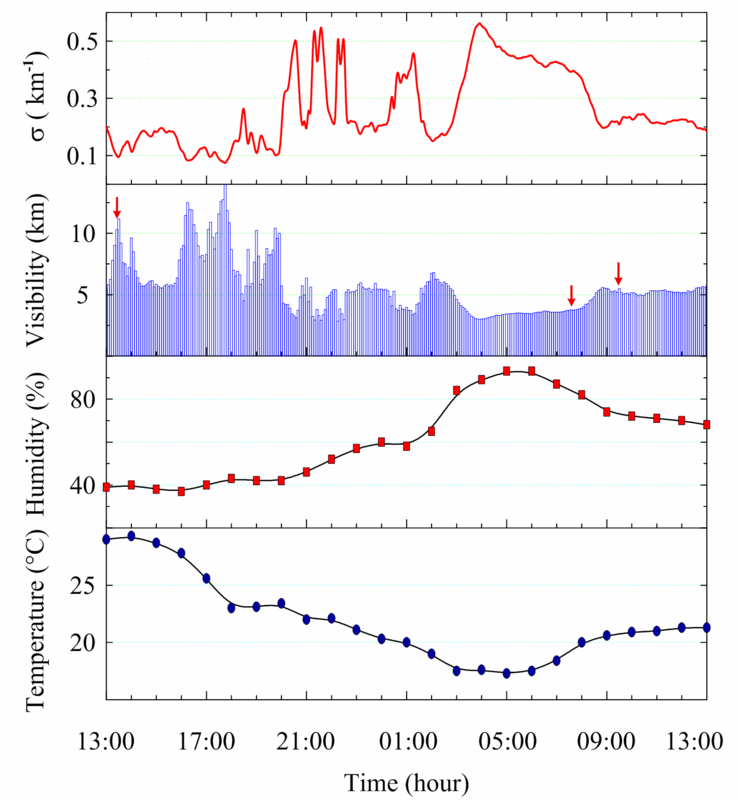 In experiments, atmospheric wind and visibility over 48 h are detected in the boundary layer. The lidar shows good agreement with the ultrasonic wind sensor, with a standard deviation of 1.04 m/s in speed and 12.3° in direction. Fig. 1. Modules of the quantum upconversion wind and visibility lidar. Fig. 2. Schematic of the compact Doppler lidar. Fig. 3. Forty-eight-hour observation of atmospheric wind and visibility. (a) Wind speed, (b) direction, and (c) visibility, temperature, and humidity. 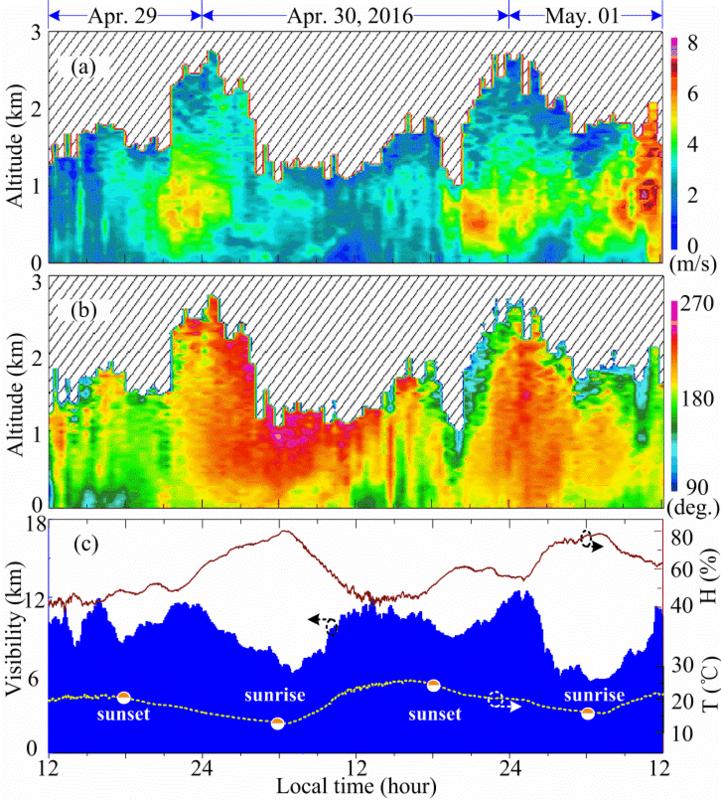 Haiyun Xia, Mingjia Shangguan, Chong Wang, Guoliang Shentu, Jiawei Qiu, Qiang Zhang, Xiankang Dou, Jianwei Pan, "Micro-pulse upconversion Doppler lidar for wind and visibility detection in the atmospheric boundary layer," Optics Letters 41(22), 5218-5221, 2016. IF:3.04. A micro-pulse lidar at eye-safe wavelength is constructed based on an up-conversion single-photon detector. The ultralow noise detector enables using integration technique to improve the signal-to-noise ratio of the atmospheric backscattering even at daytime. With pulse energy of 110μJ, pulse repetition rate of 15 kHz, optical antenna diameter of 100 mm and integration time of 5 minutes, a horizontal detection range of 7 km is realized. In the demonstration experiment, atmospheric visibility over 24 hours is monitored continuously, with results in accordance with the weather forecasts. Fig. 1. System layout of the infrared aerosol lidar. Fig. 2. Experiment raw data from lidar. (a)Backscattering signal of 24-hour continuous horizontal detection start at 13:00 on Oct. 26, 2014. (b) An example of smoke detected in the sight of the lidar over one hour. Fig. 3. Experiment results, from top to bottom, are extinction coefficient, visibility, Humidity and atmospheric temperature near ground. Fig. 4. Photographs of the scene in situ under different weather conditions during the 24-hour lidar detection. 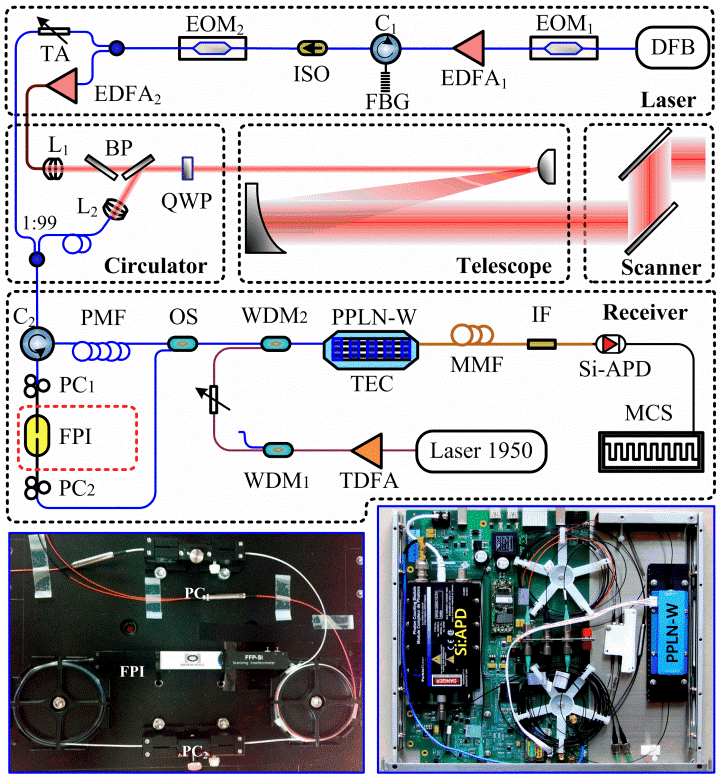 Haiyun Xia, Guoliang Shentu, Mingjia Shangguan, Xiuxiu Xia, Xiaodong Jia, Chong Wang, Jun Zhang, Jason S. Pelc, M. M. Fejer, Qiang Zhang, Xiankang Dou, and Jian Wei Pan, “Long-range micro-pulse aerosol lidar at 1.5 µm with an up-conversion single-photon detector,” Optics Letters, , vol. 40. No.8, 2015. IF: 3.39.